I would like to invite you to join me for my last 2012 Melbourne workshop to be held this coming weekend, March 23, 24 & 25. We will begin the weekend with a Friday evening lecture on the history of drawing and the exploration of various techniques that artists have adopted over the centuries. Special emphasis will be placed on the sight-size drawing method and the Charles Bargue course, the “Cours De Dessin”. On Saturday morning we will put all that theory into action and take on the challenge of cast drawing. Each student will have their own cast to work from, and the drawings will be done in charcoal. Sunday is model time and we have six hours to draw the figure with the same pose throughout. Each student will have their own designated spots and the drawings will be done in pencil on Stonehenge paper. 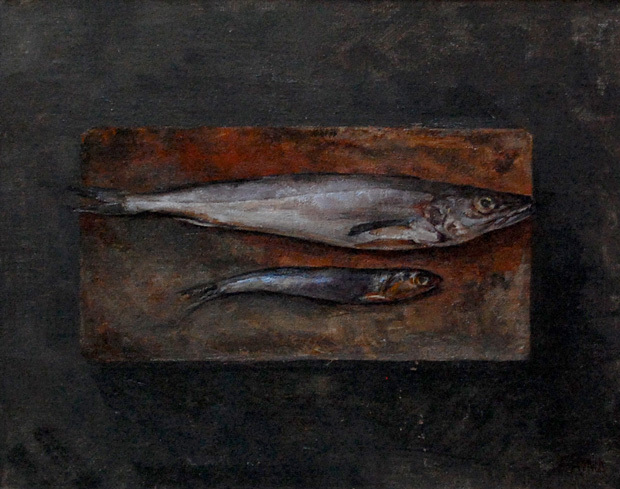 The cast is typically set-up on the left and the sight – size charcoal drawing is done on the right. The tuition fee is $485 and includes all costs including studio equipment (casts, stands, background fabric and easels) along with required drawing materials ( high quality paper, pencils, fusain charcoal, kneaded erasers, plumb lines and mirrors). Model fees are also included. I do hope you can join us! Please reserve your spot as soon as possible. We have space for six students and enrollment is based on first come first served! Please note that this is an introductory drawing course and all levels of experience are most welcome. If you cannot participate in all three days of the workshop but would like to join us just for the Friday night lecture, the Friday night lecture fee is $25 and refreshments (including vino!) will be served. Please write to enquiries@andreajsmith.com or call 0477 416164. 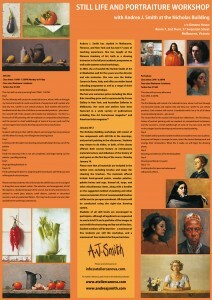 Atelier Canova is please to announce Andrea J Smith will be conducting painting workshops in Melbourne, Australia during January 2012. The Nicholas Building workshops will run for 10 days over two weeks and consist of two parts – still life painting in the morning and portrait painting in the afternoon. Students may choose to do either or both of the classes offered. On the first day of the course, there will be an introductory materials lecture and slideshow of the history of each genre on the first day of the course. Students of all skill levels are encouraged to participate, although all applicants are requested to send a brief CV and a portfolio of five images to assist with the structuring and the layout of the class. Student numbers will be kept low – a maximum of five students per still life class, and a maximum of four students for the portrait class. All materials are included in the tuition cost, excluding brushes and soaps (for cleaning brushes). For further information about the course structure and materials provided to you please refer to the brochure. For enrollment or more information please send an email to info@ateliercanova.com. 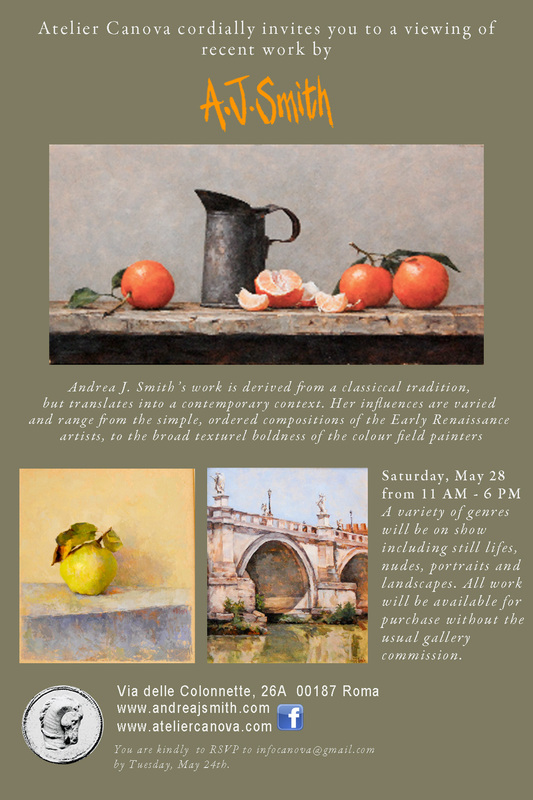 Atelier Canova is proud to announce it will be hosting an exhibition and sale of works by Andrea J. Smith on Saturday May 28th. 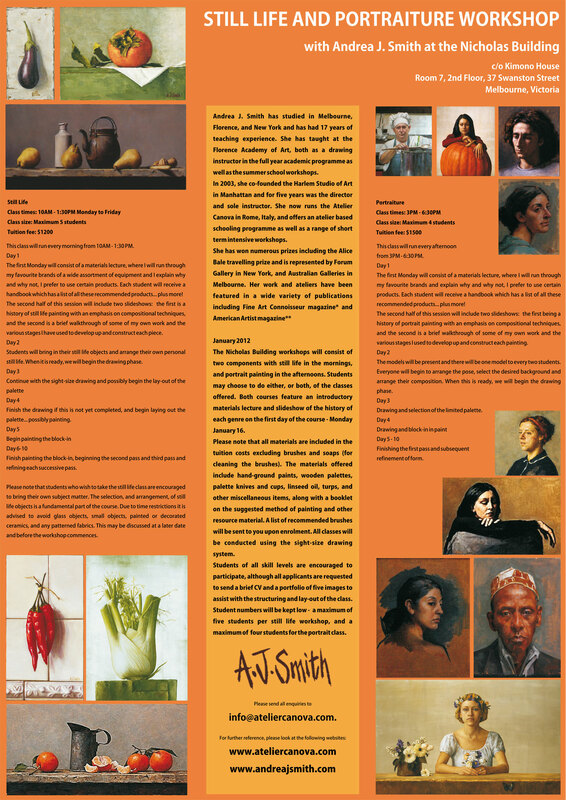 The exhibition will include: still lifes, portraits, landscapes & cityscapes, figure painting and drawings. There will also be a display of work by some of our students, and the opportunity for visitors to learn more about the school and our courses. The gallery will be open to the public from 11.00 until 18.00. I’m proud to be part of this year’s Artists For Africa exhibition. 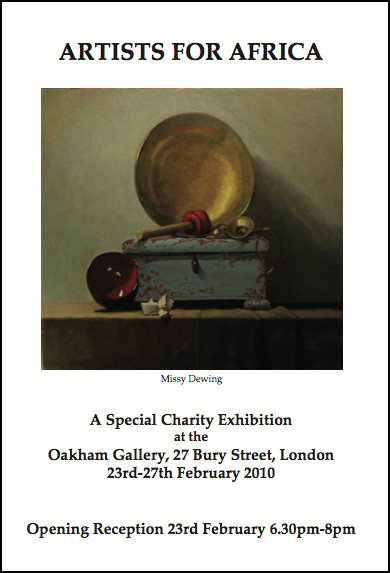 Held at Oakham Gallery in London, this will be the second time I’ve been involved in this event. This time I will have around ten paintings, mostly still lifes and a portrait painted specifically for the show. So please come along and show your support, the opening reception is 6.30pm-8pm on the 23rd February 2010. I thought I’d share this painting with you. It is a painting that I did when I first moved to Rome after the studio started to take shape and my school was getting on its feet. I guess I felt like I still hadn’t settled in quite yet and I still had one foot in America and one foot in Italy. Anyway, it is a painting of me and my little buddy Frank, swimming along together. No prizes for guessing who is who… Frank is the cute little blue one, always by my side!! A few months ago American Artist Magazine came to visit me in the studio to follow up on a limited colour palette method. View the article online here. The butcher gave Frank a bone and I put down on a tea-towel so he wouldn’t dirty up everything. But I guess he wasn’t interested in eating it right there and then so he tried to hide it. He spent 40 minutes (while I was sitting at the computer) pushing his mattress, the blankets, his towel and the tea-towel into a mini mountain so that no-one could find it!!! Poor baby… he needs a back yard! Or a sandpit in my lounge room!! Welcome to my first blog! I’ll be posting information about Atelier Canova classes, workshops, painting tours to the country, and all things related to art and living in Rome. Please feel free to comment and discuss things with me, or even suggest things you’d like to know about.